This is a guest post by Kelly Fong, a content editor at 2U. The other day, I clicked on a social media post captioned “You have to watch this,” and started to wonder: What makes a campaign go viral? How did I go from reading the news to watching a fireman save a kitten on YouTube, and why is it that this particular ad received more than 27 million views and a similar ad didn’t? I decided to dig a little deeper to understand why this happens and how campaigns become so wildly popular. I found, just from browsing my social media news feeds, that most advertising evokes a strong emotion: happiness, empowerment, nostalgia, sadness. This emotional connection is exactly what advertisers want to achieve. I knew that browsing my newsfeeds wouldn’t be enough to explain the virality of content or why exactly advertisers choose to grab us by the heart strings, so I spoke with two experts in the field—psychoanalyst Gail Saltz and Google’s head of strategic planning Abigail Posner—and learned that it should come as no surprise that all the sharable ads and content we see on social media makes us feel something. It makes sense. If we feel good, we’re likely to act on that high soon after. In my experience, if someone gives me a free sample of mango chicken on a stick, I’m probably going to remember to eat there next time. I’ll probably have a smile on my face and be pleasant to talk to afterwards too. Why? Free things equal happy camper, and those happy feelings will be associated to the people or brand that made me feel that way. And that happy feeling will linger even after the brand is out of sight. The same applies in advertising. Brands like GoPro, Coca-Cola, Doritos and Apple deliver campaigns that represent their company mission and vision. Apple wants its audience to feel like they’re getting something that is not only innovative, shiny and new, but also useful—a tool that will make day-to-day tasks easier to accomplish. They also want their audience to feel like they’re part of a lifestyle or community of thinkers and doers. They do this with commercials that represent people of all backgrounds. Pay attention to the look and feel as well: Crisp video and sound, soft glows, bright colors and happy faces; people doing everyday tasks in innovative ways. Now, think of Coca-Cola. Remember those polar bear ads? You’ll notice a common theme many of us strive for and can relate to: bliss, enjoyment, happiness. 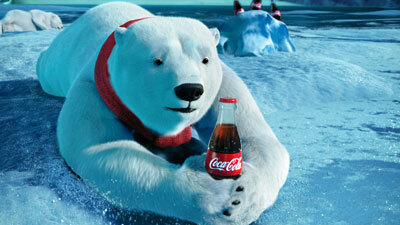 The polar bears crack open a Coke bottle and look so overwhelmingly satisfied and happy that it makes us want one too. Those emotions are all deeply integrated in Coca-Cola ad campaigns because they’re also ingrained in Coca-Cola’s mission. Part of the reason why is because happiness represents one of many current cultural values. From a psychological perspective, when we feel something, we think, “What can I make of this, what can I do about this?” The deep response often happens first and we then rationalize it and make sense of it cognitively. Those responses have dominance and lead us to a certain behavior—like word-of-mouth sharing or social media liking. In many cases, we engage or disengage with brands based on our past experiences, biological traits and temperament. Some of us might be drawn to the adopt a kid advertisement more than another group. However, all humans seek to find significance and meaning in what we see, and there is absolutely a universality to how we react to common situations like a loss of someone, a drive to do better, a desire to gain more. That’s why brands launch advertisements that resonate with the audience on an emotional level—remember that next time you stumble on a viral hit and start wondering why. Kelly Fong is a writer and editor with more than eight years of journalism experience. She is currently pursuing a Master of Science in Communications at Newhouse through Communications@Syracuse. Fong is based in Maryland and works as a content editor at 2U. You can finder her on LinkedIn or Twitter.